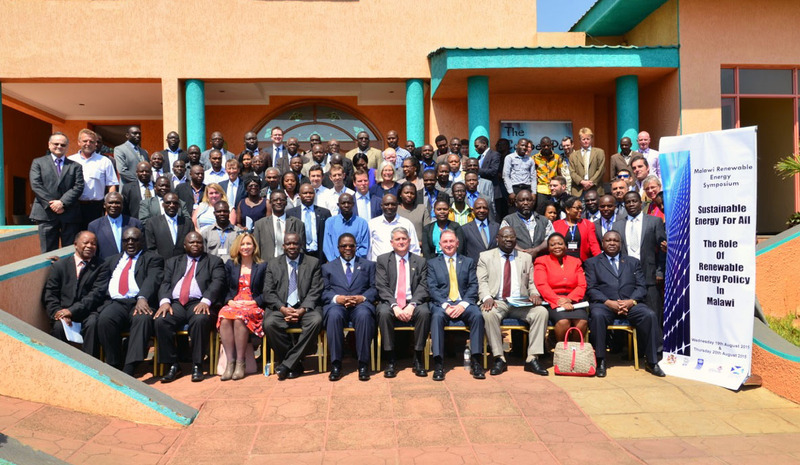 Over August 19-20 the 2015 Malawi Renewable Energy Symposium was held in Lilongwe Malawi and included nearly 140 attendees. The Symposium was a major milestone for the MREAP programme as it provided a key opportunity to disseminate results to stakeholders working in the energy sector in Malawi from government to industry, academia and civil society. In addition to MREAP, the Symposium provided a forum for debate on the current Malawi energy policy development process which is underway (with a dedicated session for it), as well as technology sessions (on smart grid and wind energy), and discussion cross-cutting issues and achieving impact with energy access. I would like to highlight some key points from presentations which addressed challenges in community energy, a topic which the Energy for Development team is actively researching, and discuss some of the key points which I found to be particularly valuable. Edgar Bayani discussed the efforts and approach taken by Community Energy Malawi under MREAP which resulted in around 20,000 beneficiaries in total and 46 CE projects. He presented factors for a ‘good’ CE project which centered strongly around targeting needs, recognition of local structures and people within the development process, importance of capacity building, and need for an ongoing support mechanism for projects. He argued that the current lack of a district office for energy (as opposed to other ministries such as health and education which have district presence) is a barrier to the development of new projects and ongoing support efforts of those projects already in place. Indeed, it largely through the establishment of Community Energy Malawi, that the MREAP projects have depended on for ongoing support, not a district office. This is an important innovation tried under MREAP, but the organisation itself now requires its own funding support. A key question now is how this role will be filled in the future? Kelvin Tembo discussed specific sustainability challenges for solar PV installation in Malawi, which has been a historical challenge for the country. Many issues are cited as potential culprits: roles and responsibilities not clearly defined, lack of technical capacity by local operators, poor original design, minimal training — to name a few. Kelvin also made a strong case for need of local level planning that goes into developing community energy projects, echoing Edgar’s sentiment. Under the Solar PV Sustainability Study, implemented under MREAP and surveying 43 existing solar PV systems at rural public institutions, we found further evidence in support of Kelvin’s observations. For example, around 1/2 of the projects surveyed stated there were no stakeholders involved — quite startling! Training (at inception) was delivered in only 40% of the projects and ongoing training was almost non existent. One observation from the study is that sustainability certainly cannot be taken for granted and implies a holistic approach is taken to design and implementation. Tracy Morse presentation included the results of a larger body of work on Healthy Settings within the Scotland Chikwawa Health Initiative (SCHI). The presentation aimed at identifying the role energy plays in community development and included some results from 18 communities in Chikwawa. The approach is holistic, cognizant of differing needs from community stakeholder groups (i.e. women, marginalised groups, etc. ), is based on self generated priorities, and aware of the ‘social capital’ that a community may have. As a development approach it clearly has many merits. An interesting result from SCHI, and one that deserves further discussion, is the relatively low priority level of energy when compared to all other needs, despite a concurrently low satisfaction level with the current energy situation. An implication could be that perhaps energy interventions need to be more closely tied to the priority areas of the community where possible, or even be implemented after higher priority items. Finally, a few thoughts from my own contribution to the Symposium. Under MREAP we invested considerable effort to the establishment of sustainable community energy projects and are likewise proud of the level of impact for poor communities throughout Malawi. During this process we were able to revise and, I would argue, make substantial improvements on the community energy model typically deployed. Briefly, a longer development cycle involving a high level of community empowerment and training led to communities that on the whole were better prepared to manage projects. In addition, each project involved the community in the development of business plans which were implemented to bring in revenue to support the underlying assets. Finally, the creation of Community Energy Malawi as an ongoing support organisation, as was mentioned before, will reinforce the communities will technical support, training, and guidance over time. Despite these improvements, it is also clear that true sustainability will require even more emphasis on financial performance and ongoing training to achieve long-lasting impact. As a means to achieve this there are many options, not all equal, but could include yet more investment in the development approach leading to more capable communities, empowering organisations that can assist in development and offer ongoing support, or a more direct role for existing institutions such as the Department of Energy Affairs or ESCOM (the national utility).